Mystified is set to stream on iFLIX on March 29 at 9 p.m.
Actress, producer, and Red Turnip co-founder Jenny Jamora directed her first full-length play, 33 Variations, in 2015. Just recently, she helmed The Sandbox Collective and 9 Works Theatrical’s staging of Every Brilliant Thing, a one-woman show starring Terresa Herrera and alternate Kakki Teodoro. Host turned entrepreneur Maggie Wilson-Consunji just opened home furniture and lifestyle store Casa Consunji, located at Acacia Estates. At the launch of her partnership with GoDaddy, when asked for her advice to aspiring entrepreneurs in their 30s with no business background, Maggie says, "The internet is a great place to start a business because you don't need to open a physical store. It makes it that much esier for you to start something small. "So for someone who wants to start a business, who has never done it before, start small first. Sell a product that you believe in... and start selling to your friends first. See how they react to your product... your friends should cririque you really well. "If it's a small business, you don't need to put in a large sum or a large capital. I notice that here in the Philippines, a lot of small businesses are all homemade or handmade stuff, whether it's food, soaps, or accessories, so start small if you're scared to spend... And be open to advice from other people that have businesses. "And don't be scared to try something [new]. This isn't my first business venture, it's actually my second... so it's okay to fail the first time, and so you learn from that; and the second one, you come back even better." "From a radio DJ, I became personal trainer (I still am! ), a fitness physique champion, and now an Nike NTC Trainer, while, at the same time, attaining a professional executive coaching certification with the ICF," writes Sari Marsden in an interview. "In my experience, the people who are willing to accept support are the ones who produce the biggest results. No one said you had to do it on your own"
"My vision is to empower women to discover and embrace their core strength and beauty. I do it by integrating many passions in my life: personal development, nutrition, leadership, sports, health and fitness, and executive coaching. 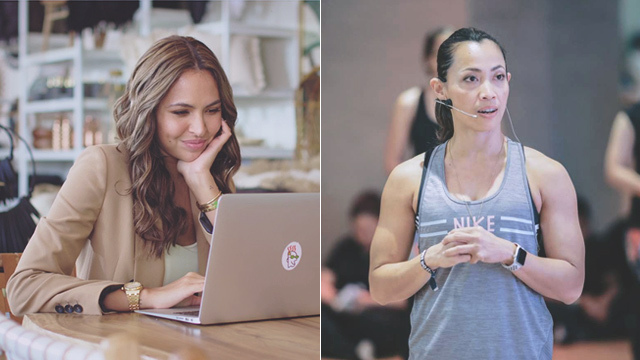 Bianca Gonzalez-Intal joins the She Talks Asia team, the women-led group behind last year's successful Body Love Conference. According to co-founder Lynn Pinugu, Bianca has been heavily involved in the video content they've been putting out to raise awareness on their advocacies. This year, they're back with another event called #WeAreEnough, happening at the Globe Tower in BGC on March 15.